Dr. Luviano is a board-certified comprehensive ophthalmologist with an emphasis on diabetic retinopathy, cataract surgery, and also board-certified in clinical informatics. His interest in medicine as a young boy prompted him to attend the Dr. Michael Debakey High School for Health Professions in Houston. As a U.S. Army Reservist, he graduated from the University of Texas at Austin. After that, he earned a medical degree from the University of Texas Southwestern Medical School in Dallas. This was followed by an internship in general surgery at Methodist Hospital Dallas and an ophthalmology residency at the Los Angeles County Martin Luther King Jr./Drew Medical Center. During residency, he was awarded the American Society of Cataract and Refractive Surgery Excellence in Research Resident and Fellow Scholarship. Dr. Luviano is on the faculty of The Osler Institute, which helps prepare ophthalmologists for board certification. His interests include quality metrics, laser safety, telemedicine, healthcare privacy and aviation medicine. 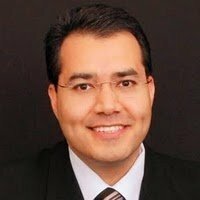 He is a reviewer for numerous journals, including Ophthalmic Surgery, Lasers & Imaging, the American Journal of Ophthalmology and Diabetes Care. It is like taking off dark glasses, so bright I can see. We have been very pleased with his taking care of the eye problem have good feelings about all our appointments. Thank you. Everyone has always been very nice, polite and helpful. I think that the doctor did a very well job, I am pleased. Thank you. Dr. Luviano very good in all aspects recommend him to others. Surgery went well. Doctor very good. Excellent. This doctor made sure that I understood that a corrective surgery on my right eye would be the last (3rd) and may not provide the result I want. I have ten years to look forward to. - Adina done good. Good exam real nice. - Been coning here long time everyone nice. - Eye surgery can help me see better painless. Went as planned. Tech: Adina was very nice and efficient. Dr. Luviano best ophthalmologist I have ever had! I would give him a rating of 6+. Everyone / staff and Dr. Luviano. All were wonderful. Tech Adina was complete and polite. Dr. Luviano was very friendly and easy to talk to made me feel very safe with my eyes in his care. - Appointment reminders not timely. Since I have been coming to the VA I have had excellent care every time. 2. I see great after surgery. Very pleased with the care provided. Dr. Luviano and Adina were professional in explaining the diagnosis and procedure. (Checked in about 7:15, 7:30 appointment time). Visit in 8/30/16. Notified front desk after 15 minutes wait. Staff member left to check what was going on, came back, was told I would be seen soon. Around 8:15 went back to front desk, was asked by same person if I was seen when I stated no. She was shocked went again to see what was going on. I informed her I could not wait due to another appointment. She returned and told me to go ahead and go to my next appointment and come back after. Upon returning to eye clinic. Was seen within 5 minutes. I have been treated by pro's that care. Surgery went very well, was pleased with out come. Doctor very informative. I am 100% happy with my eye care here and I have and receive best care from my doctor. Excellent staff. Adina is especially pleasant and professional. It is a joy to be around her. Don't usually interact with the "desk employees", but today I had to due to being late today. They were extremely polite and helped ease fear of being today. "Dr. Socks" is the absolute BEST to be examined by. His personality eases all the fear of possibly having surgery. Everything is explained to a very fine point. Took time to explain procedure and any possible complications. Did not rush right into do the procedure but made sure I was comfortable with what was about to happen. The staff informed well as to what to do and why. They informed as to what they were doing. Also they ask if I had questions which is important to me. The way they conducted their self was clear and ti the point, I really safe and well informed as to the condition of my eyes and what to expect I feel my total care given to me was outstanding and I'm thankful for them, staff and a doctor who take such much time and care in doing their jobs ( they really do more then a job; it's an act of kindness). Can see much better since surgery. Doctor is very nice to us veterans. My experience has been very good. Dr. Luviano is a pleasant man to see. I trust him to take good care of my eyes. The procedure on his right eye last Tuesday went extremely well. He felt much better after laser surgery. The doctor was very positive and great attitude. He put my husband and I at ease about surgery. Treatment is excellent as is the manner of dealing with me as a patient. Return calls immediately within one hour. Dr. Luviano best bedside manners ever known. Adina is super nice. The VA needs more people like Adina and doctor. Doctor explains with you really well. Adina is the best technician in the eye clinic. Dr. Luviano the greatest miracle Christ performed on earth was to heal man's soul. The next miracle was to heal man's sight. Matthew 9:27. Thank you for all you have done for me and Mary. We wish you well, God bless. Very professional, friendly and welcome questions from patients, most of all very precise with what ever your diagnoses maybe. I would refer everyone that needs a nice and friendly doctor, Dr. Luviano would be the one. Shows personal concern for patient and their needs. Gives personal attention to patient's concerns. A doctor who has a caring heart for others. Dr. Luviano is a very patient man with my questions and concerns about my health care. he is a very hands on person. PS his staff is super helpful. Thank you doctor. I love Dr. Luviano he is very sensor and curious and take as much time as you need to understand what’s going on with you.